And so full circle, as I’ve not known a season finale so hotly anticipated as this one. 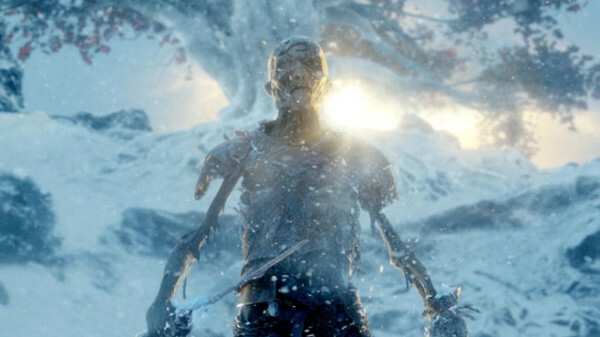 The internet has been ablaze all week with article upon blog upon preview, promising Episode 10 to be the most mind-blowing, hand-wringing, face-melting and all round ill-est Game of Thrones season closer yet. I don’t remember such a hoo-ha this time last year, so I’ll admit I was expecting quite a lot from “The Children”. I can confirm, it does not disappoint. This is too faint praise for what I’ll happily claim is one of the finest hours of television I’ve witnessed. If I’ve said it on these pages once, I’ve said it…well, probably ten times; Season 4 is the best season of Game of Thrones so far. It’s Season 5 of Buffy. Except I’m not crying right now. No, I’m whooping and crowing, postulating and poring over “The Children” in a way that only great telly can provoke. I’ll try not to fawn or flatter too much, but the opiate of rich narrative progress is coursing through my veins as I write this, so bear with me; it’s heady stuff. 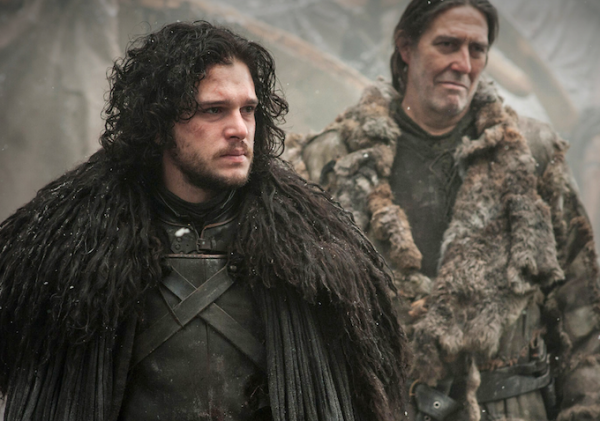 I was, I’ll admit, perturbed to see our story pick up exactly where we left off in Ep 9; with Jon Snow grimly crunching his way through hundreds of nearly-Walkers to find Mance Rayder and play at a parlay. Patience is the friend of good storytelling though, and as Snow’s crap plan comes to fruition tout suite, a thoroughly more interesting surprise befalls the King-Beyond-The-Wall and his would-be assassin; an invasion! An eerily organised one, all pretty to look at – a totally effective pincer attack. Through the two minutes of horse-mounted carnage, amid cries of “who are you? !”, various theories were bandied about from our sofa; no, White Walkers probably wouldn’t bear standards, and where the hell would Daenerys get that many horses? The Dothraki abandoned her! My better half won the guessing game, and who should ponce up through the smoke looking every type of smug, but Stannis “The One True King” Baratheon, so turning the luck of a child of Ned Stark, a motif that runs through “The Children”. 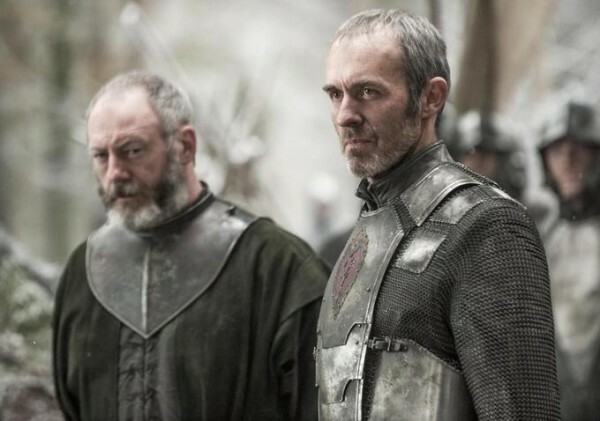 It seems Stannis is as magnanimous in victory as he isn’t in defeat, and after failing to get Rayder to bend the knee, he turns a courteous ear to the son of his last champion regarding what to do with the captured Wildlings and their leader. 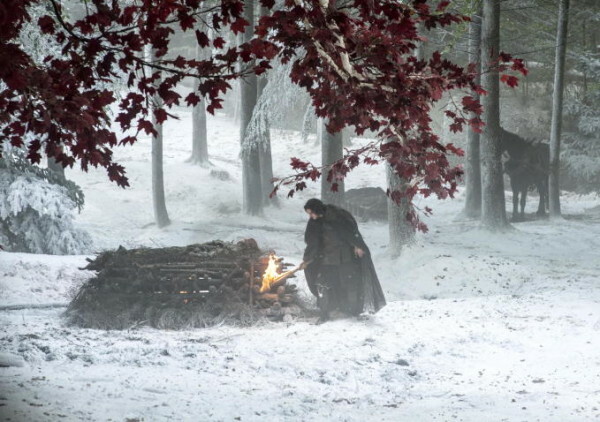 Snow’s warning about what the dead may become after nightfall doesn’t fall on deaf ears either, and both the Crow and Wildling fallen are given pyres. It was a credit to the character’s impact as well as Alex Graves’ unhurried approach to proceedings that Ygritte is given a proper send-off all her own by Jon Snow. To see her face finally at peace as his crumples under his grief was a poignant moment, respectful and somehow right. Certainly, a part of my mind was whispering “gods, please don’t let her turn” like it was an episode of The Walking Dead, but thankfully, good taste prevailed. All in all, a win oop North in my eyes, with a pleasing significant survival count at The Wall of ‘2’. Mance Rayder and Tormund; more to learn from these two, I think. Another warrior malingering under a Maester’s watchful eye is Gregor Clegane. Since my book-reading Dad let slip that the tip of Prince Oberyn’s spear was poisoned a fortnight ago, this came as no surprise. However, Pa’s spoilers are misleading it seems, as dagnammit, the bloody Mountain isn’t dead yet. The creepy ex-Maester Qyburn, who healed Jaime’s wounds last season, crops up again in service to the Lannisters, this time using dubious arts to save Clegane at Cersei’s behest. 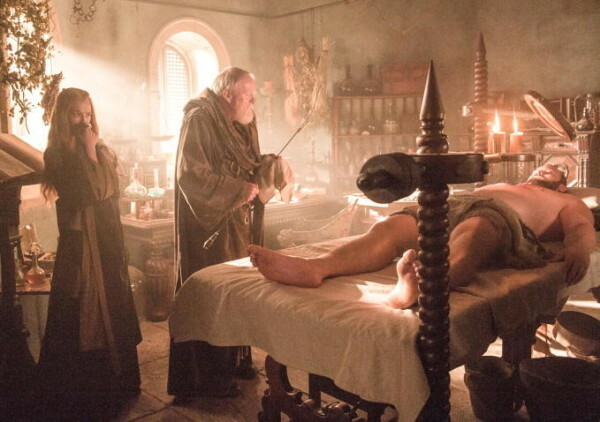 Just as I’m wondering why she would possibly care what happens to her broken champion, Qyburn issues a disclaimer about any effects the process may have on the patient. “Will it weaken him?” she asks; as we thought then, just another weapon at her disposal. Cersei moves forward in a very real way during “The Children”, albeit into another corner of the board. This pinioned position is of her own choosing though, and so for good or ill, there is growth. Each Lannister child will defy the father in this episode, finally having outgrown his brutal proclamations. Cersei leaps in first, going for full disclosure regarding her children’s incestuous provenance. It is the only move she has left to leverage against Tywin’s demands, and her lock-jawed delivery holds the coiled tension of a woman with something left to lose; her remaining son and any sense of liberty she may see within grasp. Her protection of Tommen may seem possessive, even a touch Mrs Bates, but the fact that she would disgrace her family name, bring it all tumbling down to remain by her son’s side is one reason Tyrion doesn’t go gunning for her at the episode’s close. Tywin is left mulling the horrifying revelation of his children’s depravity over, but the cogs are still whirring. This isn’t a betrayal by beloved offspring, but assets gone wonky. 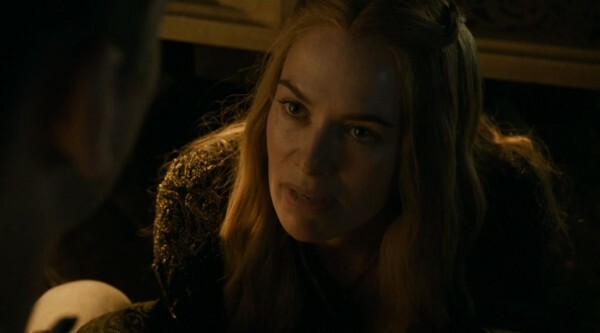 Still, it would seem Cersei has her father in Check, for the moment at least. Across the Narrow Sea, Daenerys looks similarly lost, presiding over royal audiences with a brittle eye and half a heart, now her trusted ally is removed. Yet more complications await the Khaleesi; former slaves who prefer enslavement to her badly-planned freedom, and the tragic parent of a tiny charred corpse; the result of her marvellous dragons. Her title proclaims her “mother”, so she must take responsibility for this awful and inevitable disaster. Ruling over her new world is an endless barrage of complexities, more than she naively bargained for, and as the politicians say, checks and balances must be put in place. And so comes the decision this queen must make for the safety of her subjects; Rhaegal and Viserion, named for her two murdered brothers, are drawn into the catacombs, chained up and left in distress by Daenerys, a woman committing her life to the emancipation of others. I found this a very moving scene, given real gravitas by both the excellent CG dragons, a haunting theme and Emilia Clarke’s performance of a mother forced to shackle her family, straight-spined until the final look back. If all this progress weren’t a feast already, the episode is only half done, and at this point things really kick into another gear. Giant strides are finally made on Bran’s quest for the Three-Eyed bloody Raven, a seemingly interminable riddle that continues to unravel, now replete with exhilarating Harryhausen-style battles with the undead. This visually arresting sequence features many memorable moments, not least of which involves a warged-into Hodor flinging a skeleton by it’s eye sockets, using the skull’s like a bowling ball. Alex Graves tips his hat to classic shots of the zombie genre, with skeletal hands bursting through the ground, tropes and staples hitherto avoided, and packing all the more satisfying a punch for it here. Jojen Reed has been ailing since day one, and saw his own demise foreshadowed as far back as Craster’s Keep. We are even prepared, shown the skeleton foe lying next to Jojen drawing it’s blade. It falls to the framing of the shots to carry the weight of the attack since there is no surprise – they skew it off centre, placing Meera as the focal point and witness. It is in her eyes, then through her POV, that we view the headless corpse gutting her brother, and we are reminded of her devotion and shown her devastation as she ends his life on his terms. Jojen was a difficult character to empathise with or really invest in, so selfless he was often left without much self, despite a subtle performance by Thomas Brodie Sangster. 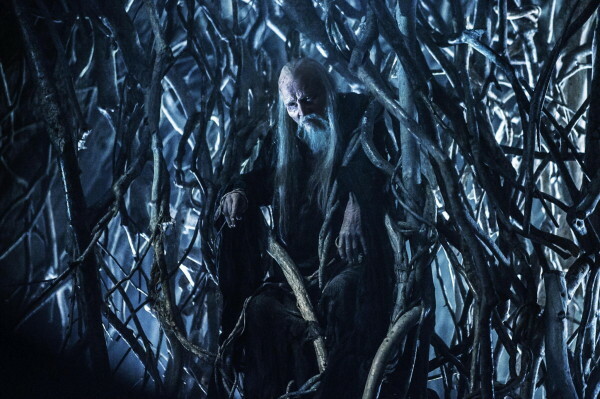 However, his death was more heroic for having been foretold, as the wizard in the tree tunnel says, and more importantly, it was necessary to the narrative; Bran is passed from one sage to another much higher ranking Seer. I’ll not attempt to decipher the whys and wherefores, or more pertinently, the from-whence-you-cames of these two new important characters (and character classes?! ), but rather revel in the sheer delight at heading deeper into the fantastical with a series whose backbone remains anchored in emotional realism and integrity. Each new sighting (Giant! Child of the Forest! Dude in a cave!) is greeted by a delicious sense of foreboding and treading a path into the unknown or long forgotten worlds with characters who show as much awe and confusion as I do. On a side note, the creeping track through the earth to a new teacher nestled among the roots set off Dagobah bells, which can no be no bad thing. 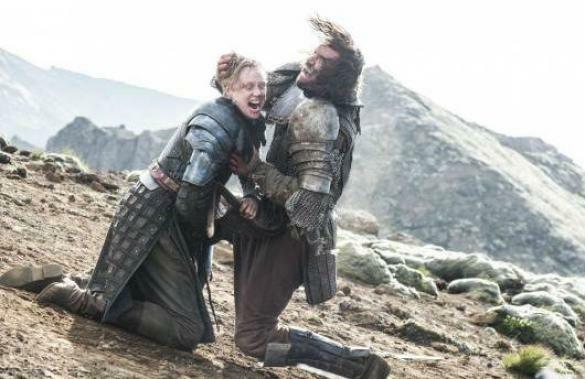 From one fight to another then, as Brienne of Tarth meets the Hound. After a promising start, with she and Arya comparing steel and giving one another appraising looks, Podrick goes and spoils it all by recognising Sandor Clegane. My futile cries of “Calm down! What are you fighting for? 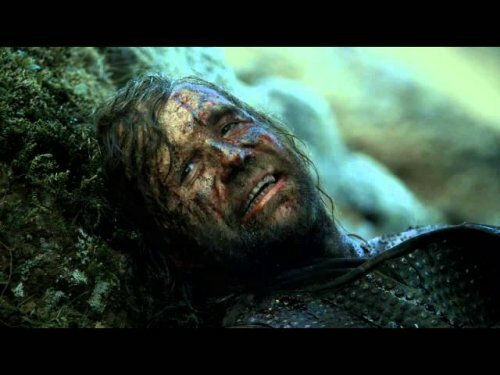 You should team UP!” couldn’t penetrate the veil, and after a lengthy battle that descends into ugly brawling and below the belt tactics, the Hound ends up toppling down a rocky hillside, whilst a worse-for-wear Brienne gives Pod an ear-lashing for losing the Stark child. What follows are the complicated and truly sad final moments between Arya and Clegane. Once his time is up, he asks her to end it for him. “You remember where the heart is?” Just barely; she is unmoved. There is nothing behind her eyes anymore, not in times of trauma. She shuts down. He tries to mock her, but it comes out fondly. He tries to bait her and talks of the butcher boy he slaughtered, but it sounds like a confession. As he re-lives his shame she doesn’t blink. He remembers Sansa, and we are reminded that he did protect her, saved her time and again. But he is not to be given the merciful death. Re-watching this scene, I’ve tried to look for more; can she simply not bring herself to do it? Is his name no longer on her list? 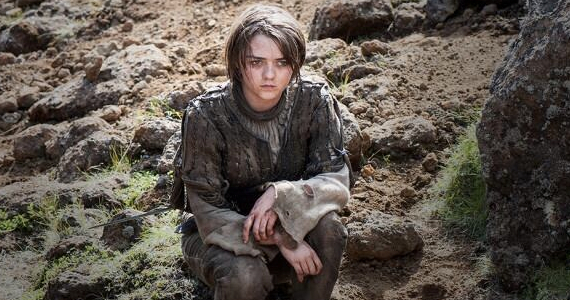 Nothing rings true except that Arya’s compassion is dead. She is only remembering the carefree young girl she once was when talking to Brienne, not being that person. 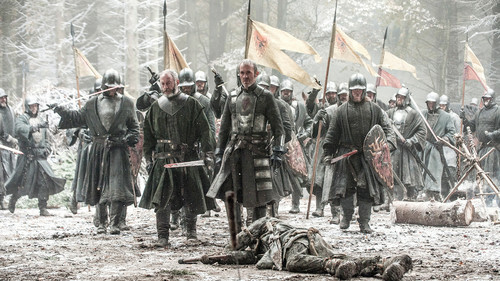 As the Hounds cries bleed over to Tyrion, also impatiently awaiting death, Jaime finally gets his chance to make a heroic turn (again with the torch, echoing Oberyn’s champion speech), by freeing his little brother into the capable hands of Varys, who waits at the end of a dark passage. He debates the tunnel, then makes a different choice. Why does he go to his father’s chamber? He is unarmed when he enters, so an attack at this stage was not the point. What he finds there is a life-changing horror, one that seemingly tips him over the red line. 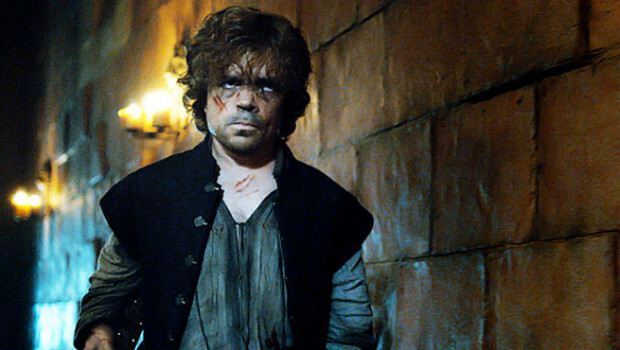 Shae has already been stripped of much of her character development during the deception at Tyrion’s trial. I still clung to a belief then that she had been tortured and was making these false claims under duress. That could still be true, but for “my lion”. Even as a pragmatic decision or a power play, it all seems wrong, unless she meant none of it, now or then. But I still don’t understand the turn. She was committed to Tyrion and his best interests – this was all an act? Did Tywin orchestrate it from the beginning? There is some conflation here between Shae and Tyrion’s first wife, but whether illogical or not, the treachery still smarts. Tyrion’s resilience has been exhausted by Shae’s final betrayal, that much is evident, but I did not see the fall coming. The term ‘crime of passion’ is a revolting sort of validation for violence, usually domestic violence, and this horrific murder comes from a character who two episodes ago abhorred the thought of squishing beetles with a rock. As he chokes the life from his former lover, his apologies veil a newly raw creature. Something has been born in this moment, Tyrion has become the monster everybody claimed he was, and he must finish what he has started. 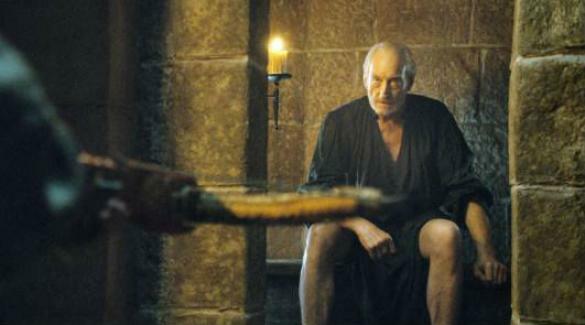 Tywin proved himself fallible in his earlier conversation with Cersei, allowing her to trump his tired old tricks. This was a first, and rang his death knell, leaving the narrative path clear for baby brother to sew things up. 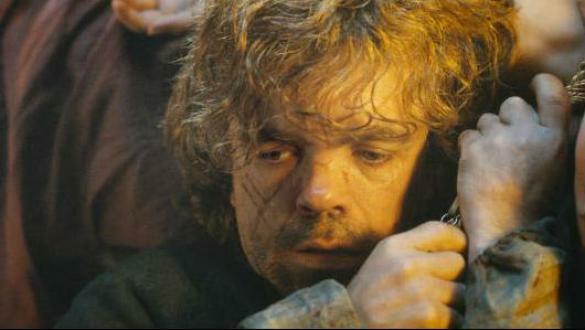 Tyrion’s calm delivery as he aims the crossbow at his father contrasts the flailing anguish of the previous scene. It is the pre-meditation rather than the patricide that is most concerning. 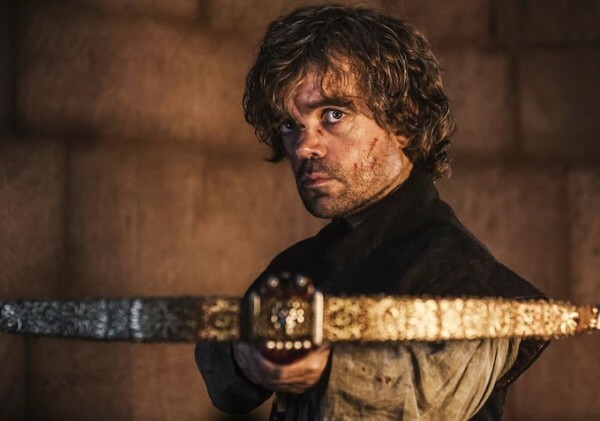 However “justified” by a lifetime of abuse, neglect and humiliation, the choosing signals a definite and horrible change in Tyrion; an innocence lost, never to be reclaimed. Varys underscores this with his admonishment, but compassionate and practical man that he is, as he hears the bell toll in King’s Landing, he joins the man in the box, and their flight begins. What do you think of the season finale? Post a comment, share, you know the drill! And so, with ten agonisingly Thrones-free months until Season 5, I will satisfy my urge to review with the final season of True Blood, starting NEXT WEEK!